The Galilean moons are the four moons of Jupiter discovered by Galileo Galilei in January 1610: Io, Europa, Ganymede and Callisto. 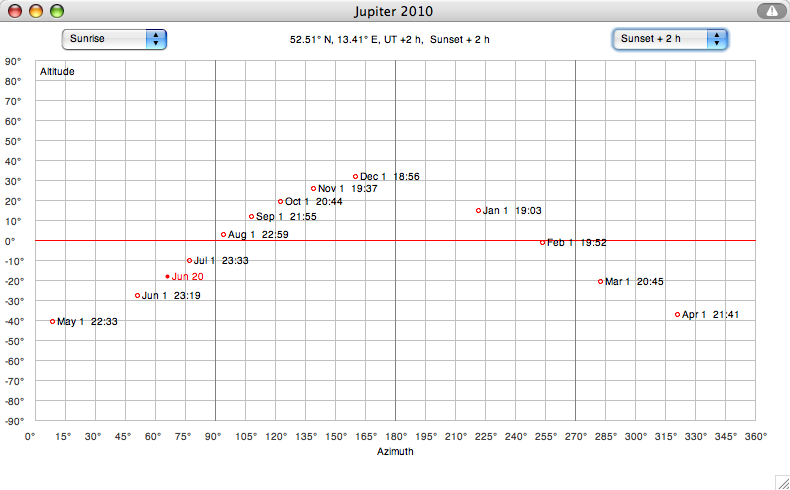 They revolve around Jupiter with periods of 1.77 to 16.69 days, and have apparent magnitudes between 4.6 and 5.6 when Jupiter is in opposition with the Sun, and are about one unit of magnitude dimmer when Jupiter is in conjunction. Check your time zone offset and select the local standard time. then press the button "Apply input". 52.51° N, 13.41° E is Berlin, Germany. You may use the keys "m", "d", "h", "n" to increase the month, date, hour, minute, or Shift key and "m", "d", "h", "n" to decrease the month, date, hour, minute ! 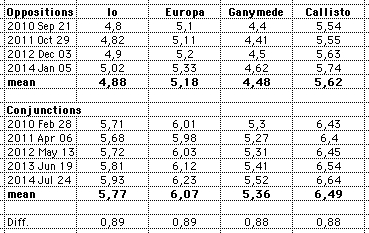 The sizes of the moons are drawn according to their visual magnitudes (accuracy about +/- 0.1 mag). 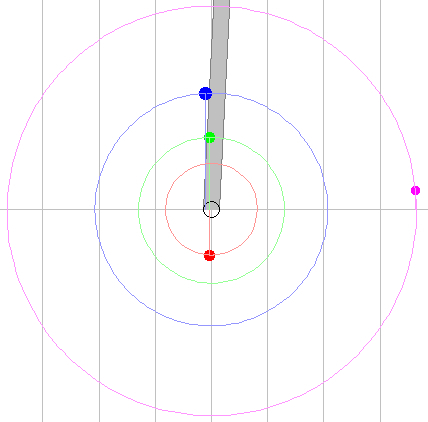 The angular distances from Jupiter, and the angle from inferior conjunction are at right. With "Orbit" selected from the "View" menu the illumination of Jupiter can be shown. The radii of Jupiter and the orbital radii of the satellites are drawn to scale. Blue: Jupiter visible in the local sky. The simplified calculations used by the applet (according to Jean Meeus: Astronomical Algorithms) is neglecting the inclinations of the orbits of the satellites on the equatorial plane of Jupiter (0.04° for Io, 0.51° for Callisto): mutual occultations can not be calculated with certainty. 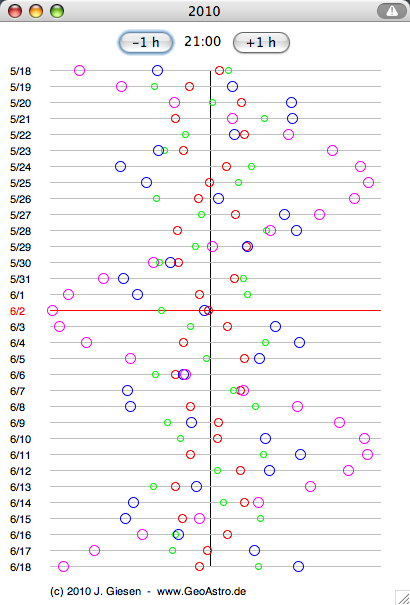 For 1610 the accuracy of times of inferior conjunctions of Callisto was tested by comparison with CalSky, and the deviations were found to be less than 2 minutes. The three inner moons—Io, Europa, and Ganymede—are in a 4:2:1 orbital resonance with each other. 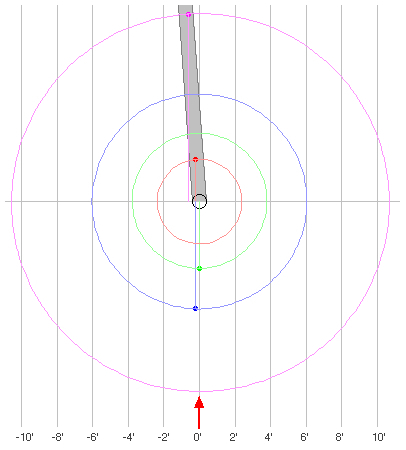 lambda are mean longitudes of the moons. 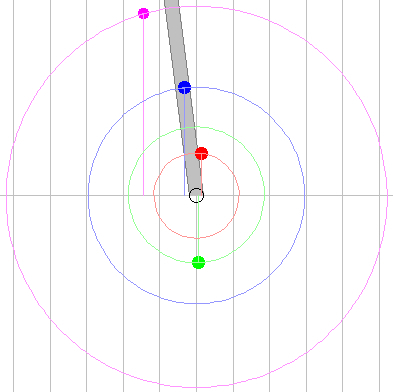 This relation makes a triple conjunction impossible. Due to the low accuracy of the algorithms used by the applet the range is 180° ± 3°. 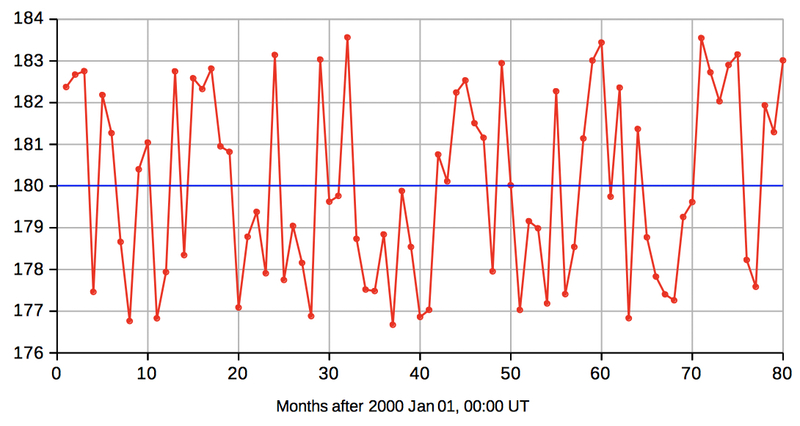 (Laplace predicted 2270 days in 1805). "Nuncius Sidereus" in Venice in March 1610. Sufficient separation for Galilei's perspicillum to observe four moons. This event is occurs far more frequently. Io transit, Europa occulted/eclipsed, Ganymede occulted. Io occulted, Europa transit, Ganymede eclipse. Simon Marius: Mundus Jovialis - Die Welt des Jupiter - Die Entdeckung der Jupitermonde durch den fränkischen Hofmathematiker und Astronimen Simon Marius im Jahr 1609 - lateinisch und deutsch. 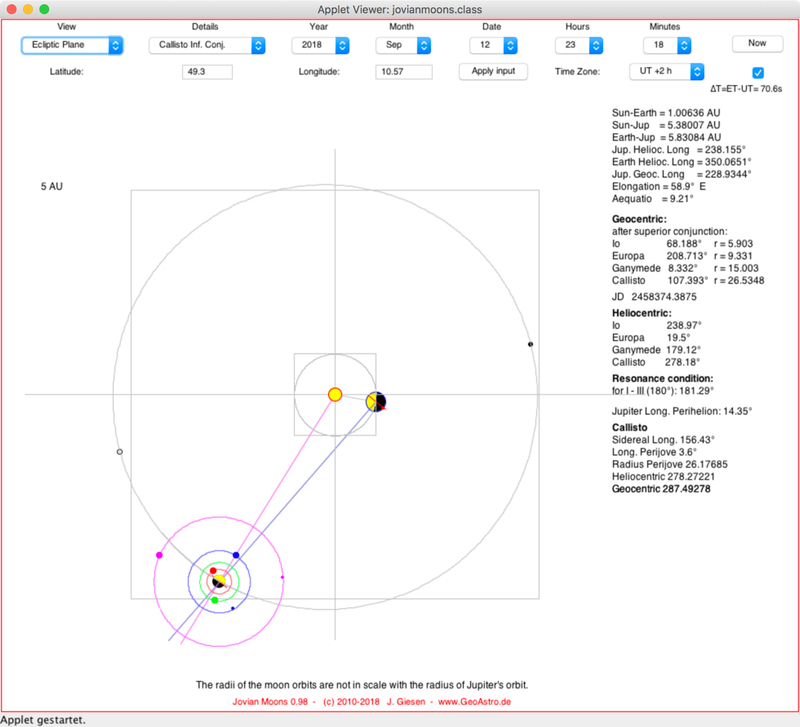 Sinclair, A. T.: The Orbital Resonance amongst the Galilean Satellites of Jupiter, Mon. Not. R. astr. Soc. (175), 171, 59-72.